It all started with Fire Mountain Gems weekly book sale. This week's book was Wonderful Wire Works: An Easy Decorative Craft for $1.81. It's on amazon for $11.27, so it was a good deal. And I had that credit. So now, I had to fill my cart with some other stuff to make the $5 shipping worthwhile. (In case you like bargain books too - here's the link to FMGs Book of the Week Sale). Did I mention I really like Surprises? 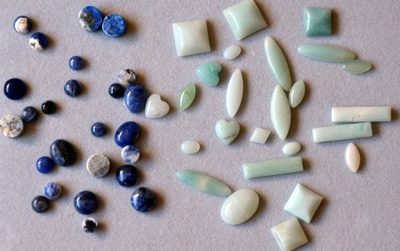 First, I ordered the amazonite cabachon assortment and sodalite cabachon assortment. They were each an assorted package of 25 cabs between 4mm to 18x10mm in a variety of shapes. I don't have any cabachons, so figured it would be nice just to get some. 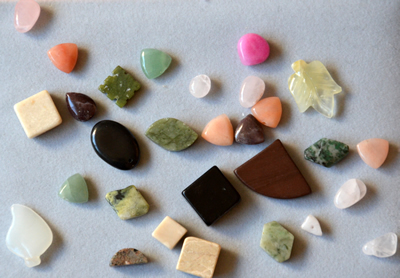 The amazonite is a much better assortment than the sodalite, but overall, they're ok. Nothing special - but I think I'll find a way to use them. I'm confused though - aren't cabachons always supposed to have a domed top? Some of the sodalite ones are just cylinders with no smooth top. Maybe it's my misunderstanding. Now, we get to the surprise part. With about $9 and change left to spend, I decide to say "what they hey" and order a Bosses Bead Bag assortment. I can't tell you why - but I love to unwrap a package and be surprised. It's even better if it came in the mail. Personal quirk I guess. And the bag was a surprise. It was a large lot of mostly glass beads, some stone beads and lots of base metal findings. I guess I could have thought about this purchase a little more and figured out what it would contain, but I'm not even disappointed. There's so many things in here that I would never buy - but it doesn't mean that I would never use them. Some of them, I would have never thought of. For example, there are hair pins with a glue on pad or loop finding. That's cool. There are lots of filigrees and bead caps. Chain extenders, ring bases and findings that I haven't figured out yet. Luckily, my daughter sorted them for me. The glass beads are nothing to rave about. Mainly druks or other rough beads. I like the gemstones, even though I know there is nothing terribly expensive in the lot. I like the simple shapes, and basic colors. You can judge the assortment for yourself. Overall, I regard it as a silly purchase - but it was fun. It's also nice to have base metal and cheaper beads on hand when my daughter wants to play or make gifts. Oh yeah - I forgot to mention that I really like the book. It's different and fun. I don't think I'd pay more than a few dollars for it though. Thanks for dropping by and your nice comments. You could always make Margaritas! They are great for cooling off. 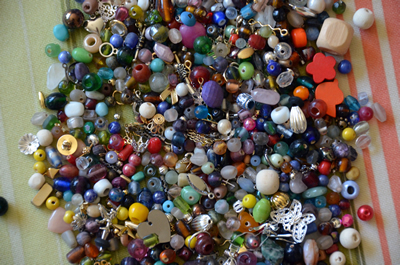 I love "bead soup" mixes! I pick through and make random-looking bracelets, and often there's pairs of beads that can make some neat earrings, too. So glad I'm not the only one! I love the surprise and getting something that I wouldn't normally buy. There's always something fabulous hiding in the mix. Very true about the earrings - and they are also great for spacer beads in necklaces and bracelets. I won one of the Boss's bead bag and had no idea of what I was getting, I was impressed with the metal findings, but there was not two of anything in my bag. So far I haven't used anything. I did get a couple of large. I will use the two large wooden beads to make beaded beads. All in all I was disappointed with most of the bag. Of course I won it, so I am not out any money. I just wish it contained more that I could use. 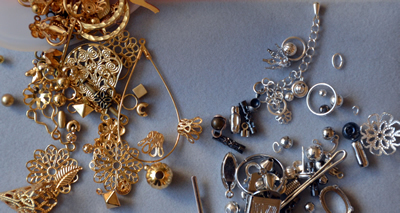 I had that experience too - there might be a single earring finding. But I had a lot of matching bead caps and beads. I also had some toggle closures that had only one half - but I think that is pretty cool. It makes me try to think of how to use what I got instead of 'only' using it as a toggle because I have two halfs and that's what I'm supposed to do with it. Lucky you for winning one. I don't think I would buy one again - but I will definitely invest in some of the things I got in it that I never heard of before. I'll post some of those things in the future. I ordered a boss bead bag and wan't very happy with mine. it had lots and lots of odd ball findings....single earrings, half of a clasp, charms with the loops missing, totally useless stuff. There were a few nice beads but also tons of very small beads that will never get used. For the money, I could have purchased several strands of very nice beads on clearance and been much farther ahead. I sure won't buy that again!